We should be diligent and faithful in helping others receive the blessings of the restored gospel. 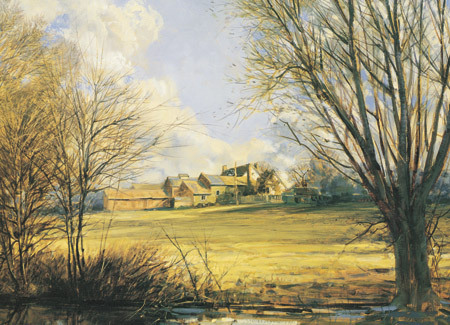 The farm of John Benbow. Through diligent Bible study, John Benbow and his family and friends prepared themselves to embrace the restored gospel. On July 1, 1838, Elder Woodruff baptized six people, including all those who lived in his father’s house, just as he had been promised in his patriarchal blessing. “It was truly a day of joy to my soul,” he said. “My father, step-mother and sister were among the number baptized. I afterwards added a number of relatives. I felt that this day’s work alone amply repaid me for all my labor in the ministry. God holds us responsible for sharing the gospel with others. We find great joy in helping others come unto Christ and progress toward exaltation. Rather than criticize others’ religions, we should live in a way that shows the truth and goodness of our own. As we sincerely nurture our friendship with others, the Lord will provide opportunities for us to share the gospel. The Holy Ghost provides guidance for those who share the gospel and for those who receive it. Review the account of Elder Wilford Woodruff going to the home of John Benbow (pages 89–91). In what ways was Elder Woodruff led to the Benbow farm? As you read this account, what do you learn from the example of William Benbow? On pages 91–92, look for words or phrases that show how William Benbow and Wilford Woodruff felt when their family members embraced the gospel. How have you felt when loved ones have joined the Church or returned to activity in the Church? Review President Woodruff’s words about our responsibility to share the gospel (pages 92–94). Specifically, what can we do to share the gospel with family members and friends? In what ways can we work with full-time missionaries in this effort? In what ways can we fulfill our responsibility to teach the gospel “to all the nations of the earth”? (page 94). Why do we sometimes hesitate to share the gospel? How can we overcome our fears? Why is missionary work such a joyful experience? (See pages 94–95.) What experiences have you had in which you have felt the joy of sharing the gospel? Why is it important to avoid criticizing others’ religions? (See page 96.) How can we testify of the truthfulness of the Church without criticizing other churches? Review the final paragraph on page 96. In what ways do our actions influence people’s opinions about the Church? As you read President Woodruff’s words about the Holy Ghost and missionary service, what do you learn? (See pages 97–98.) What must we do to qualify for the companionship of the Spirit? “History of Wilford Woodruff (From His Own Pen),” Millennial Star, March 25, 1865, 183. Gospel Standards, comp. G. Homer Durham (1941), 20. “Elder Woodruff’s Letter,” Times and Seasons, March 1, 1841, 327. Millennial Star, November 28, 1895, 754. Times and Seasons, March 1, 1841, 328. “Leaves from My Journal,” Millennial Star, November 28, 1881, 767. “Leaves from My Journal,” Millennial Star, September 19, 1881, 606. Millennial Star, September 19, 1881, 606–7. The Discourses of Wilford Woodruff, sel. G. Homer Durham (1946), 259. Deseret News, May 27, 1857, 91. Millennial Star, November 28, 1895, 755. The Discourses of Wilford Woodruff, 133. Deseret News: Semi-Weekly, February 29, 1876, 1. Salt Lake Herald Church and Farm, June 15, 1895, 385. Millennial Star, May 14, 1896, 307–9. Millennial Star, May 14, 1896, 310. “To the Officers and Members of The Church of Jesus Christ of Latter-day Saints in the British Islands,” Millennial Star, February 1845, 141–42. “An Epistle to the Members of The Church of Jesus Christ of Latter-day Saints,” Millennial Star, November 14, 1887, 729. The Discourses of Wilford Woodruff, 136. Deseret Weekly, March 2, 1889, 294. The Discourses of Wilford Woodruff, 135–36. In Conference Report, April 1898, 32. The Discourses of Wilford Woodruff, 275. “Correspondence,” Millennial Star, August 1840, 93.